The Gonzos carved pumpkins this year for the first time in ages. There were a whole lot of pumpkins goin' on at our place, and that meant a whole lot of pumpkin seeds. I seem to remember my mom salting and roasting pumpkin seeds when I was a kid, but I pretty much shun salt, unless it's crucial to a recipe. I wanted to do something... different. After an online search, I'd found about a thousand ways to make tamari pumpkin seeds, but all the recipes seemed boring. You know, The Gonzo Mama is not into boring food. 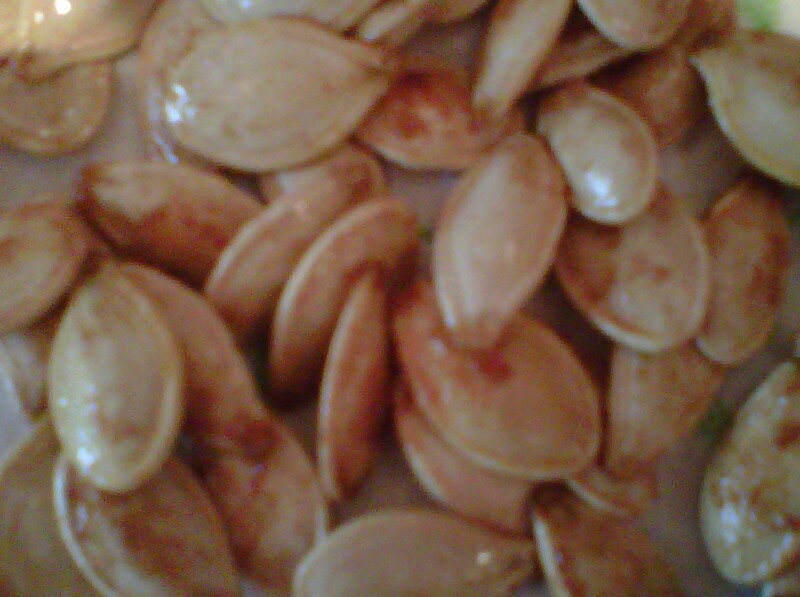 I ended up making four different flavors of roasted pumpkin seeds, and they all turned out so yummy, the kids want to gut more pumpkins so I can make more. The procedure is the same for all four. *Note: for all these recipes, I used Bragg's Liquid Aminos, which is a natural, low-sodium alternative to soy sauce, tamari or shoyu. I imagine you can use soy sauce, tamari or shoyu, but I don't know how that will affect cooking times, if at all. Blend all ingredients well before putting seeds in to marinate. **Note: This particular recipe is very prone to burning. Keep a close eye on it while in the frying pan and oven! 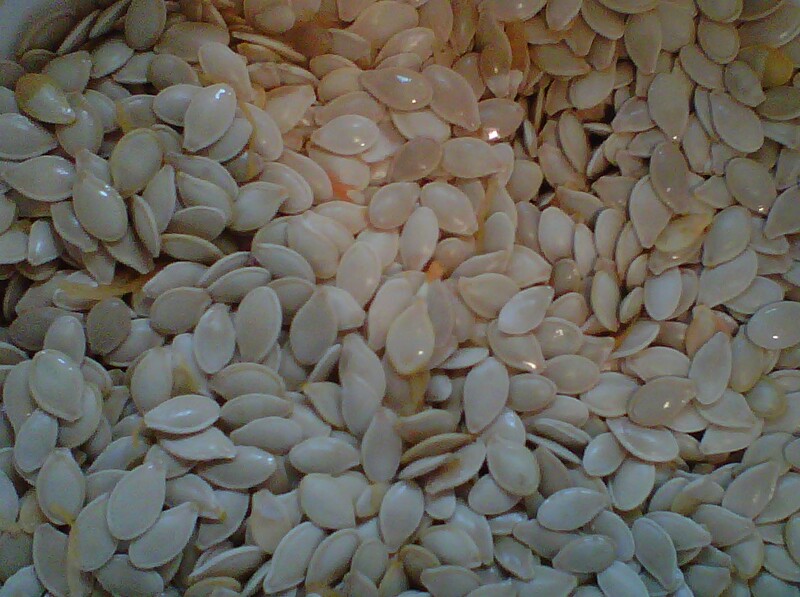 Put the pumpkin seeds in a colander and rinse them, rubbing them between the palms of your hands to remove the little strings of pumpkin funk. 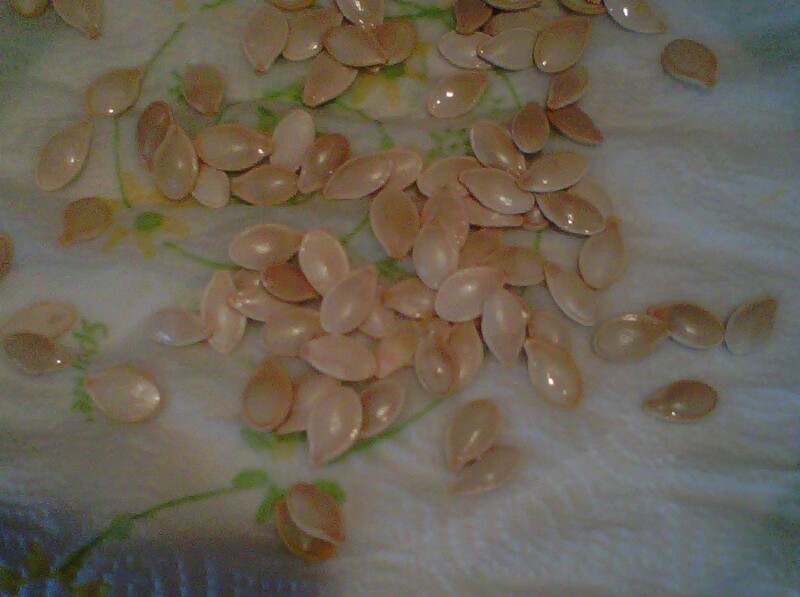 As you go, toss the clean seeds onto a plate covered with a paper towel or tea towel to drain. The eco-Nazis are going to kill me for using paper towels, aren't they? Use one of the recipes above to make a "marinade" for the seeds in a bowl, and dump the seeds in, making sure each seed gets covered. Make sure no one gets left out... Everyone needs a good coat! In a wok or large frying pan, heat a small amount of oil (I used sesame oil, but any cooking oil will work) over medium heat. Use a fork or slotted spoon to remove seeds from marinade (you want the seeds, not the liquid) and drop them into the heated oil. You'll want to keep the seeds moving so they don't burn. You'll know they're done when they start to puff up and look bloated, sort of like The Gonzo Mama after a soy ice cream binge. They're starting to bloat like fat little Gonzo Mamas stuffed with soy ice cream. Carefully remove the seeds from the oil and spread them out on a baking sheet. 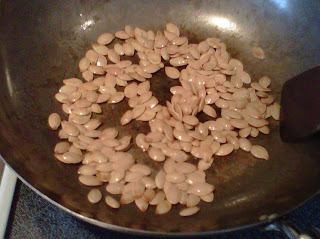 Put the sheet in the oven and roast the seeds for 10-12 minutes. The time will vary, depending on what you coat the seeds with, so keep your nose alert for the aroma of smoke and check on the seeds often! Allow the seeds to cool (if you can wait!) and enjoy. Oh, and may I also insist tossing a handful of these tasty things on top of your salad? Crunchy, spicy goodness!